Dr. Harrington is the senior engineer for the pistonless pump development effort. He is responsible for engineering design, fabrication, analysis, testing, reporting and documentation. PhD., Applied Mechanics, University of California at San Diego, joint program with San Diego State University, 1995. M.S., Aerospace Engineering, San Diego State University, 1986. B.S., Applied Mechanics, University of California at San Diego, 1984. He also is a part time faculty at University of California, San Diego where he teaches an aerospace engineering senior design where students instrument, build and fly hybrid rockets. 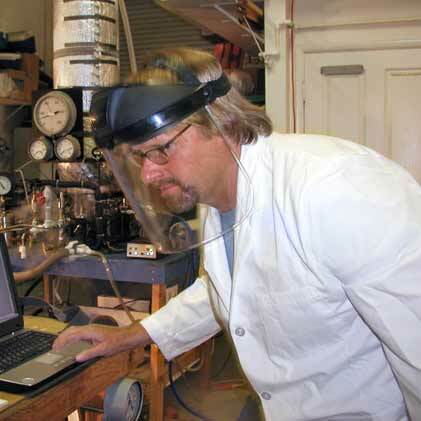 Prior to starting Flometrics, Dr. Harrington worked for Unisys, Rohr and Puritan-Bennett as an engineer specializing in fluid dynamics and heat transfer. Engineer, Puritan Bennett 9/89-1/92 Researched causes of hotfilm anemometer degradation for mass flow transducer used in a medical ventilator. Developed computer aided test system which leak tests and calibrates the above mass flow transducer and burns a PROM with calibration data in under three minutes. Analyzed flow through valves and other components of computer based ventilator. Thermodynamicist, Rohr Industries 6/88-9/89 Calculated Mach number, pressures and temperatures in aircraft environmental control system bleed ducting in normal and burst duct scenarios. Modified FORTRAN program used to calculate flows. Calculated cooling air flows and component temperatures through engine nacelles during various conditions. Researched failure modes of space shuttle solid rocket booster casing during pressure test. Designed flow visualization experiment to determine core cowl cooling airflow for A340/cfm56. Dr. Harrington has been working on a rocket pump as a self-funded project since 2001. He has presented conference papers at the AIAA Responsive Space Conference in 2003 and 2004 and at the Joint Propulsion Conference4 in 2003. Another paper on the application of the pump was presented at the AIAA Space 2004 conference. Dr. Harrington is also working with students from San Diego State University on a LOX/RP liquid fueled rocket as a student project.